Regaled by the New York Times as a “powerhouse mezzo soprano” Daniela Barcellona garners constant acclaim for her “nobility of declamation, richly focused contralto sound and expressive physicality” (Opera News). 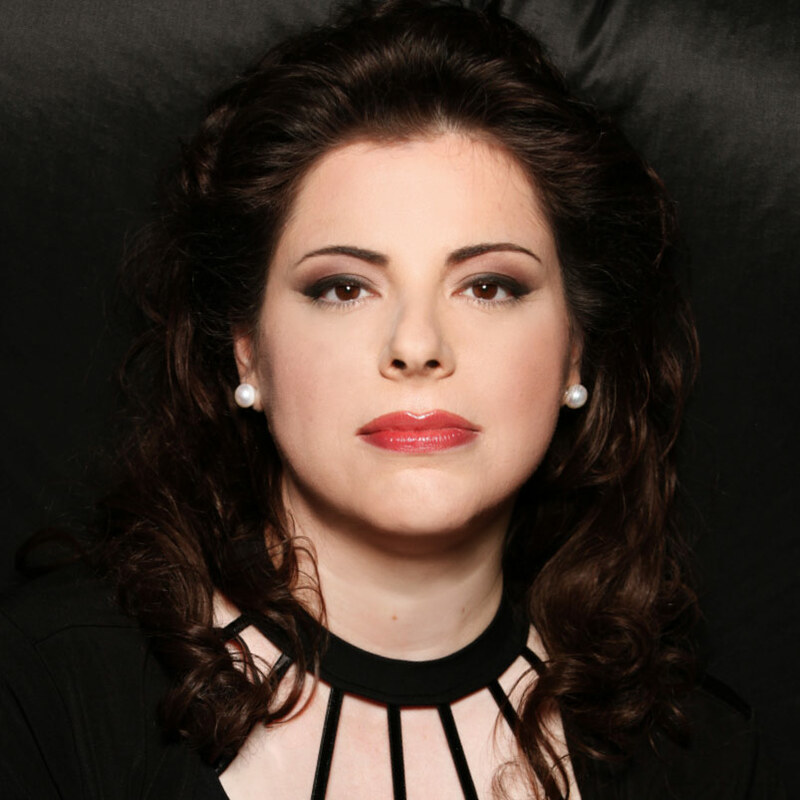 In the 2015-16 season, she returns to the Deutsche Oper Berlin as Santuzza in Cavalleria rusticana, Opéra national de Paris and Teatro San Carlo di Napoli as Amneris in Aida, ABAO Bilbao for Eboli in Don Carlos, Chicago Symphony Orchestra as Dame Quickly in Falstaff, and the Metropolitan Opera to reprise her acclaimed portrayal of Malcom Graeme in La donna del lago. She also sings her first performances of La principessa de Bouillon in Adriana Lecouvreur at La Monnaie and Nelly in Adelson e Salvini at the Barbican. Last season, she made a much-anticipated return to the Metropolitan Opera as Malcom Graeme in La donna del lago. Her other engagements included returns to the Maggio Musicale Fiorentino as Dame Quickly in Falstaff, ABAO Bilbao as Santuzza in Cavalleria rusicana, and Orfeo in Orfeo ed Euridice with the Teatro San Carlo di Napoli. She joined conductor Gianandrea Noseda for performances of Rossini’s Stabat Mater at the Théâtre des Champs Elysées and Teatro regio di Torino, where she also sang Verdi’s Requiem. She recently triumphed as Didon in Les Troyens at the Palau de les Arts Reina Sofia with Valery Gergiev conducting and also at the Deutsche Oper Berlin. She sang Eboli in Don Carlo at the Teatro regio di Torino and in Lima, Amneris in Aida in a return to the Palau de les Arts Reina Sofia and Arena di Verona, Federica in Luisa Miller and Dame Quickly in Falstaff at Teatro alla Scala, further performances of Quickly in Falstaff at Dutch National Opera, and Baba the Turk in The Rake’s Progress with Christopher Hogwood with the Teatro Real. One of the foremost contemporary interpreters of the works of Rossini, Donizetti, and their contemporaries, Ms. Barcellona’s performances in this repertoire are celebrated in her native Italy and beyond. She has sung Maffio Orsini in Lucrezia Borgia, Malcom Graeme in La donna del lago, Marquise Melibea in Il viaggio a Reims at Teatro alla Scala; the titles role of Adelaide di Borgogna, Sigismondo, and Tancredi, Malcolm Graeme in La donna del lago, Arsace in Semiramide, Calbo in Maometto II, Falliero in Bianca e Falliero, Ottone in Adelaide di Borgogna, and concerts of bel canto literature at the Rossini Opera Festival in Pesaro with Alberto Zedda conducting many peformances; Léonor in La favorite with Opéra de Monte-Carlo, Isabella in L’italiana in Algeri, Rosina in Il barbiere di Siviglia, Angelina in La cenerentola, Tancredi, and Arsace in Semiramide with Teatro dell’Opera di Roma; Adalgisa in Norma at the Teatro Regio di Parma; Giovanna Seymour in Anna Bolena at Teatro San Carlo di Napoli and Teatro Regio de Torino; Tancredi and Rosina in Il barbiere di Siviglia at the Teatro de Maggio Musicale Fiorentino; and Leonora in La favorite and Angelina in La cenerentola with Teatro Carlo Felice. Equally successful outside of Italy, she has sung Adalgisa in Norma at the Metropolitan Opera and New Israeli Opera; Romeo in I Capuleti e i Montecchi at Opéra national de Paris; Isabella in L’italiana in Algeri with the Bayerische Staatsoper, Semperoper Dresden, and Houston Grand Opera; Rosina in Il barbiere di Siviglia at the Wiener Staatsoper; Arsace in Semiramide with Teatro Real and Grand Théâtre de Genève; Romeo in I Capuleti e I Montecchi and Malcolm Graeme in La donna del lago at the Salzburger Festpiele and Royal Opera House at Covent Garden; Isabella in L’italiana in Algeri and Tancredi with Opera de Oviedo; Léonor in La favorite, Romeo in I Capuleti e i Montecchi and Rosina in Il barbiere di Sivilia at the Festival de Ópera de Las Palmas de Gran Canaria; Tancredi with Teatro de la Maestranza; Isabella in L’italiana in Algeri with ABAO Bilbao; and further performances of Malcolm Graeme in La donna del lago at the Teatro alla Scala, Opéra national de Paris, Opéra Royal de Wallonie, Quincena Musical de San Sebastián, and Festival Radio France Montpellier. Ms. Barcellona’s concert performances include Berlioz’s Roméo et Juliette with the London Symphony Orchestra; Verdi’s Requiem with Muti conducting the Chicago Symphony Orchestra, and at the Arena di Verona, Verbier Festival, Danish National Symphony Orchestra, Teatro regio di Torino, Teatro Carlo Felice, Sydney Opera House, London’s Royal Albert Hall, Toronto’s Roy Thompson Hall, and on tour throughout Italy with Riccardo Chailly conducting; Mahler’s Symphony No. 2 at the Teatro del Maggio Musicale Fiorentino, and Beethoven’s Missa solemnis at the Sydney Opera House and Basilica di Santa Maria Sopra Minerva. She has sung numerous previous performances of Rossini’s orchestral works including the Stabat Mater at the Rossini Opera Festival in Pesaro as well as in Sydney, La Coruña, and Valencia, and Giovannid’Arco and the Petite messe solennelle in Pesaro. Her musical endeavors include collaborations with other such celebrated conductors as Riccardo Muti, Roberto Abbado, Claudio Abbado, Wolfgang Sawallisch, Dan Ettinger, Fabio Biondi, Gianandrea Noseda, Kent Nagano, Riccardo Frizza, Keri-Lynn Wilson, George Prêtre, Jesus Lopez Cobos, Sir Colin Davis, Evelino Pidò, Bruno Campanella, Paolo Olmi, and Myung-Whun Chung. Ms. Barcellona discography comprises over twenty recordings to her credit that includes Verdi’s Requiem with Claudio Abbado conducting on EMI Classics. Her recent performances of Les Troyens with Valery Gergiev conducting have been released on the Metis label.